A classic pair of 9ct white gold stud earrings set with diamonds. Bring a little extra glamour to your look. 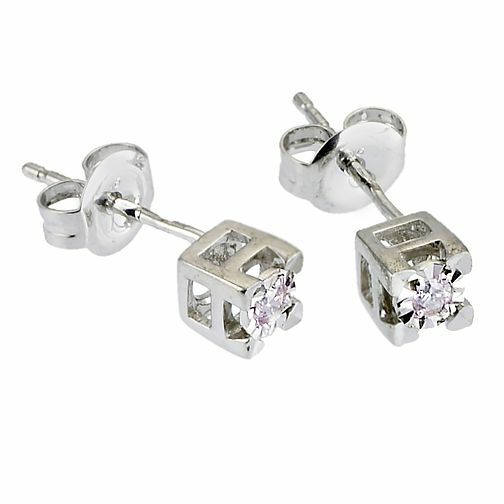 9ct White Gold Diamond Stud Earrings is rated 3.5 out of 5 by 2. Rated 2 out of 5 by Anonymous from Disappointed These were a gift & was very disappointed. They are big for studs and as ear post is not in middle are very low down in the ear. They do not sparkle as much as described. Rated 5 out of 5 by simsy from Excellent value This product was excellent value for money,and looks stunning when worn.I bought these ear-rings for my daughter as a xmas gift and she was over the moon with them.